Margo Ernst, 68, lives with her husband in Golden Valley, AZ, a town about 25 minutes outside of Kingman, AZ. The first thing you notice when you first meet Marguerite, or Margo, Ernst is her warm, sweet personality. The next thing you’ll likely notice is the breast cancer ribbon tattoos on her right hand – a ring tattoo on her finger and a pink survivor “bracelet” on her wrist. Margo is a currently battling breast cancer, for the second time. Margo, 68, lives with her husband in Golden Valley, AZ, a town about 25 minutes outside of Kingman, AZ. Margo moved to Golden Valley in 2005 to be closer to her daughter, who lives in Henderson, Nevada. Margo retired from her job with the county in 2012, which left her without insurance. 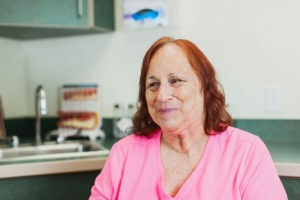 Margo then turned to North Country HealthCare, where she was able to receive primary care without insurance by utilizing the sliding fee scale. When Margo turned 65 she enrolled in Medicare. 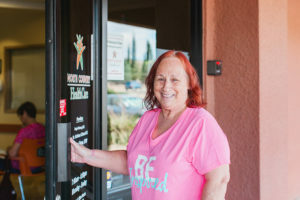 No longer in need of the sliding fee scale, Margo had the option to see any primary care provider in the Kingman area. She decided to continue her care at North Country, because the staff there felt like family to her. Margo Ernst visits North Country HealthCare in Kingman for primary care. Last year Margo was diagnosed with stage four breast cancer after having a routine mammogram. Her hormonal therapy treatment consists of daily oral medication. Margo says she feels good most of the time, but occasionally deals with some fatigue. Beside her cancer treatment, Margo is also taking medication for her blood pressure, high cholesterol and blood clots. Margo comes to North Country every other week to complete an INR test, and she sees her provider, Kathleen Florea, FNP for regular health maintenance. Right now, Margo is focused on beating cancer so she can live a long, active life. With their free time, Margo and her husband love to travel, visiting new restaurants and casinos. They hope to purchase an RV so they can travel even more with their two dogs. To help us keep patients like Margo healthy do to the things she loves to do, we need your support. Make a donation to North Country HealthCare’s foundation today.